Reforestation efforts in dryland ecosystems frequently encounter drought and limited soil productivity, although both factors usually interact synergistically to worsen water stress for outplanted seedlings. Land degradation in drylands (e.g. desertification) usually reduces soil productivity and, especially, soil water availability. In dry sub-humid regions, forest fires constitute a major disturbance affecting ecosystem dynamics and reforestation planning. Climate change projections indicate an increase of drought and more severe fire regime in many dryland regions of the world. In this context, the main target of plantation technology development is to overcome transplant shock and likely adverse periods, and in drylands this is mostly related to water limitations. In this paper, we discuss some selected steps that we consider critical for improving success in outplanting woody plants, both under current and projected climate change conditions including: (1) Plant species selection, (2) Improved nursery techniques, and (3) Improved planting techniques. 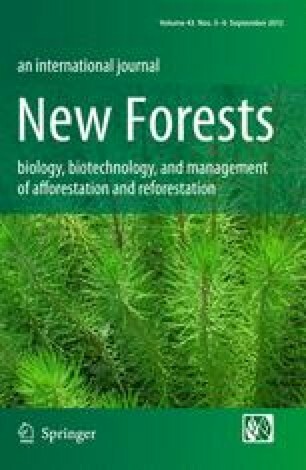 The number of plant species used in reforestation is increasing rapidly, moving from a reduced set of well-known, easy-to-grow, widely used species, to a large variety of promising native species. Available technologies allow for reintroducing native plants and recovering critical ecosystem functions for many degraded drylands. However, climate change projections introduce large uncertainties about the sustainability of current reforestation practices. To cope with these uncertainties, adaptive restoration approaches are suggested, on the basis of improved plant quality, improved techniques for optimizing rain use efficiency in plantations, and exploring native plant species, including provenances and genotypes, for their resilience to fire and water use efficiency. This paper summarizes some of the outputs generated from research projects funded by the European Commission (FUME - GA243888, and CREOAK - QLRT-2001-01594), by the Spanish Ministries of Science and Innovation (GRACCIE-CSD2007-00067, CONSOLIDER-INGENIO 2010 Program, LORAIN-AGL2008-05532-C02-02, SURVIVE-CGL-2011-30531-CO2-02) and Environment (RECUVES - 077/RN08/04.1; ESTRES, 063/SGTB/2007/7.1), and by the Regional Government of Valencia (APLITEC, GV 05/208; INNOVA, GVPRE/2008/085; FEEDBACKS-PROMETEO/2009/006). Special thanks to the Forest Service in Alicante (Consellería de Medi Ambient, Aigua, Urbanisme i Habitatge, Regional Government of Valencia) for the support given to research. We sincerely thank Carla D’Antonio for her comments and suggestions on the manuscript and the revision of the English version. Fundación CEAM is supported by Generalitat Valenciana and Fundación Bancaja.